For some people, installing a solar product at ground-level may seem unnatural. 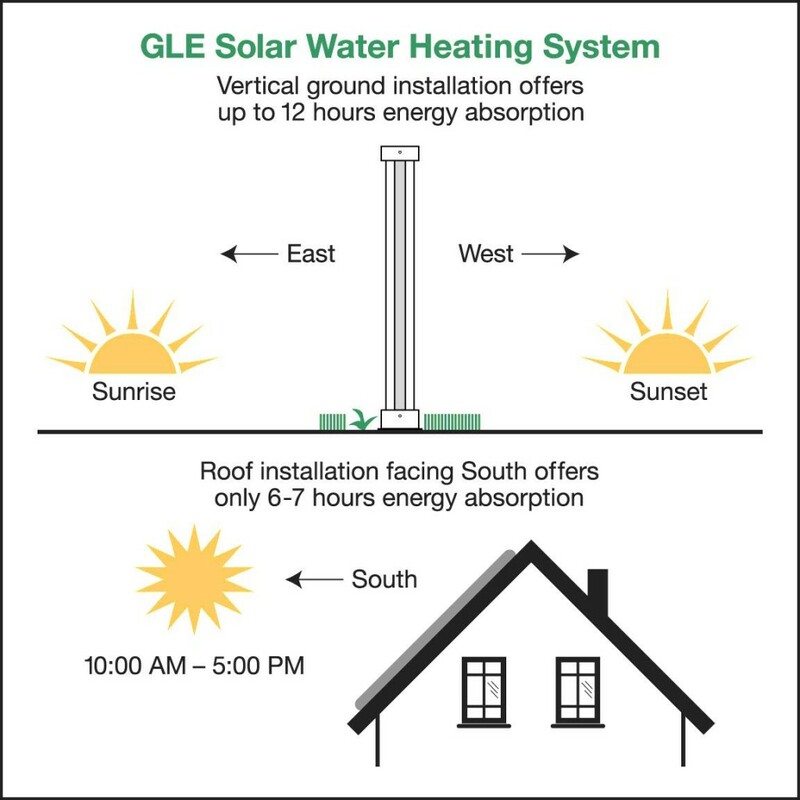 PV and traditional solar hot water collectors are expected to go on the roof, because they need to be positioned at an angle that closely matches the slope of most roofs anyway. However, by freeing solar water heating technology from the confines of the roof, GLE Solar has unleashed the wasted potential of the evacuated tube. Flat plate collectors and traditional evacuated tube collectors only really absorb solar radiation for 6-7 hours each day. The sun’s rays must approach a flat surface within a certain range of angles to get absorbed, so flat plate collectors achieve far less than 180o absorption. Evacuated tubes should be able to absorb sunlight equally from any angle, but standard ETCs contain a heat pipe that effectively separates the fluid-filled interior in half. The half of each tube facing the roof becomes useless. GLE Solar does nothing to limit the potential of our evacuated tube batch collectors. They do not contain a heat pipe, and they are designed to be installed on a patch of ground with limited obstructions. As a result, we can offer the only solar thermal product designed to achieve 360o solar absorption. With our large evacuated tubes and their unrestricted access to solar radiation, no one can off a collector with greater functional surface area. Of course, the greater absorption isn’t the only reason to prefer a ground-mounted unit. A roof installation must meet local, state, and federal codes to guarantee that the collectors are securely mounted. This often requires expensive modification to reinforce the roof. Roof installations can also take three or more installers a full day to complete. Two professionals can install a GLE Solar unit in a fraction of the time, and no modification to your home or business will be necessary.